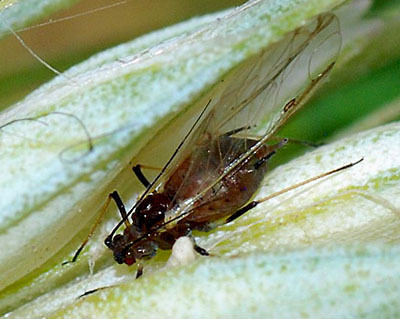 The adult aptera of Sitobion avenae (see first picture below) is medium-sized and spindle-shaped. It shows colour polymorphism with green and brown forms predominating (immatures are green or red.) The antennae are black and somewhat shorter than the body. The legs are yellow but with the tips of femora, tarsi and tibiae dark. The siphunculi are cylindrical and black and somewhat longer (1.1-1.5 ×) than the pale pointed cauda (cf. Sitobion fragariae which also occurs on grasses, but has its siphunculi 1.7-2.7 × the length of the more rounded cauda). 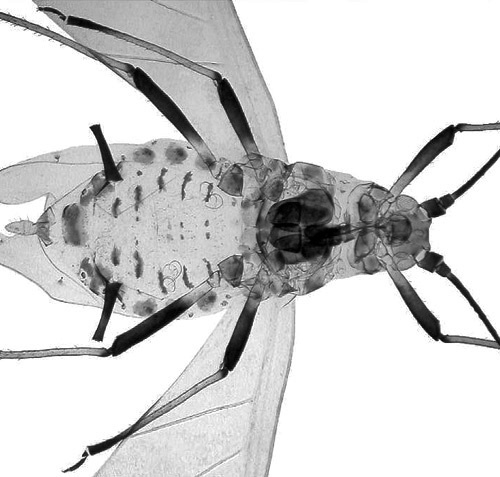 The Sitobion avenae aptera body length is 1.3-3.3 mm. The alate Sitobion avenae (see second picture above) is 1.6-2.9 mm. long and also occurs in two colour forms - green and brown. It has distinct dark intersegmental markings on the upper surface of the abdomen. The clarified slide mounts below are of adult viviparous female Sitobion avenae : wingless, and winged. There is no host alternation and Sitobion avenae spends its entire year on cereals and grasses. It occurs on all cereals including rice and maize and can develop on most grasses (Poaceae), as well as on some rushes (Juncaceae) and sedges (Cyperaceae). 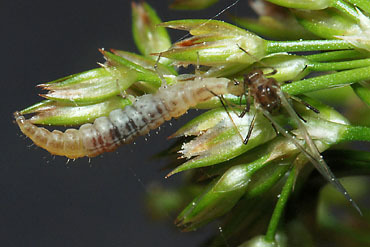 The majority of the population is anholocyclic (produces only asexual morphs) and overwinters as nymphs or apterae on grasses or winter cereals, but a small proportion of the population is holocyclic (alternates parthenogenetic with sexual reproduction) and overwinters as eggs which hatch in March. Sitobion avenae is widespread throughout the world, with a preference for temperate climates. It occurs widely in Europe, North Africa, the Middle East and Asia. Because much of its population overwinters as nymphs or apterae, Sitobion avenae numbers can increase rapidly in a warm spring. 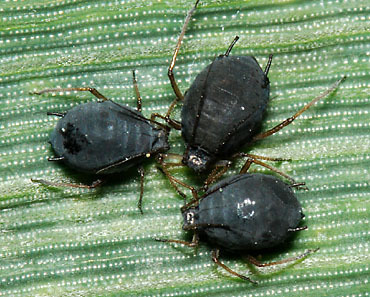 Colonies of wingless aphids develop on the flag and upper leaves of cereals and grasses. As the plant matures, aphids move to the developing flowers - the emerging ears in the case of wheat. Winged forms develop in late May leading to establishment of many more colonies during June. Winged forms continue to be produced throughout the summer in response to increasing population density and declining food quality. In autumn these move to re-infest cereals or other grasses. Sitobion avenae infests not only grasses but also sedges and rushes, thus providing a massive reservoir for infestation of cereal crops. The picture above shows a female english grain aphid on a rush (Juncus). The two colour forms are especially noticeable in late spring when colonies of bright green or reddish nymphs can be seen on the leaves (see below). 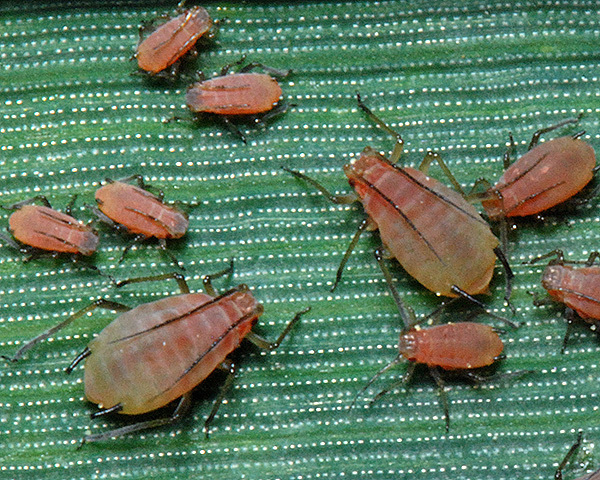 Colour in the english grain aphid is determined both genetically and in response to environmental factors (Jenkins et al., 1999). The biological significance of the colour polymorphism is unknown, although seasonal changes occur in the frequency of colour morphs in the field. Several studies have looked at the wide range of parasitoids and predators found attacking Sitobion avenae. Probably foremost amongst these are parasitoid wasps. Sigsgaard (2002) surveyed the species present in Denmark and found Aphidius ervi and Aphidius rhopalosiphi to be the dominant primary parasites. We have also found Aphidius ervi commonly in UK, but also Ephedrus plagiator and an Aphelinus species, both of which have black mummies as shown below. 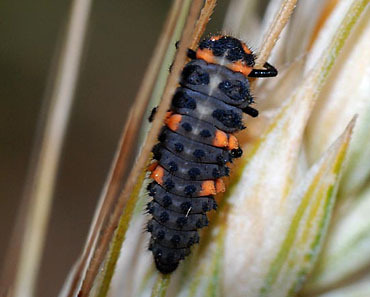 Predators include the adults and larvae of ladybirds (Coccinellidae), larvae of hoverflies (Syrphidae), gall midge larvae (Cecidomyiidae) and lacewing larvae (Chrysopidae). 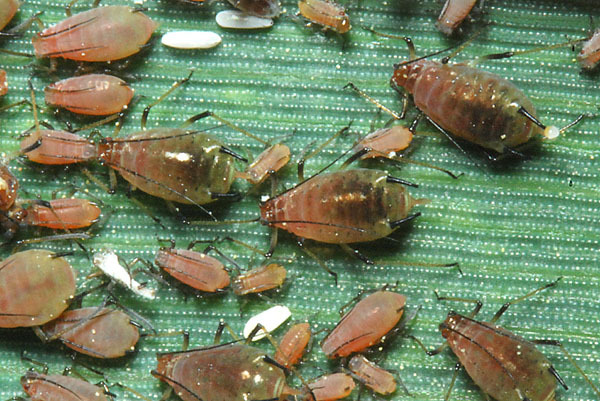 All of these live in the upper vegetation of cereal fields and feed predominantly on aphids (Wratten & Powell, 1991). Ground-dwelling predators such as spiders (Araneae), carabids (Carabidae) and rove beetles (Staphylinidae) have a much wider prey spectrum, but include aphids in their diet. The pictures below show a coccinellid larva (left) and a chrysopid larva (right) - the chrysopid is feeding on an alate English grain aphid. Populations on wheat may be adequately controlled by natural enemies with no need to resort to chemical control. This was concluded by Chambers et al. (1986) who sampled aphid populations in 19 fields in UK, but in no case found that populations increased to densities liable to cause economic damage. Krauss et al (2011) compared the abundance of cereal aphids and their predators between organic and conventional field. 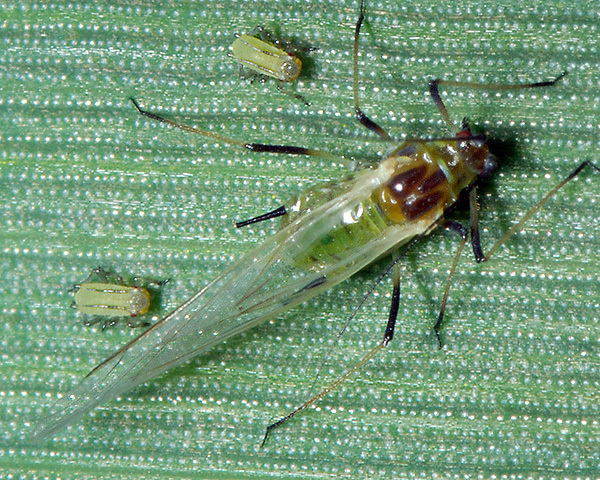 Cereal aphid numbers were five times lower in organic fields, while predator abundances were three times higher in organic fields, indicating a significantly higher potential for biological pest control in organic fields. They found that insecticide treatment in conventional fields had only a short-term effect on aphid densities while later in the season aphid abundances were even higher and predator abundances lower in treated compared to untreated conventional fields. Whilst the results of these studies appear promising, one should be aware that only descriptive or observational designs were used - in other words there was no random allocation to treatment. This may severely bias results - for more on this see our review on effect of organic farming on biodiversity. A more convincing case for the impact of natural enemies on cereal aphids was made by Schmidt et al. (2003). They looked at the effect of removing or excluding either ground-dwelling predators or flying predators and parasitoids or both on cereal aphid populations in winter wheat compared with open controls. 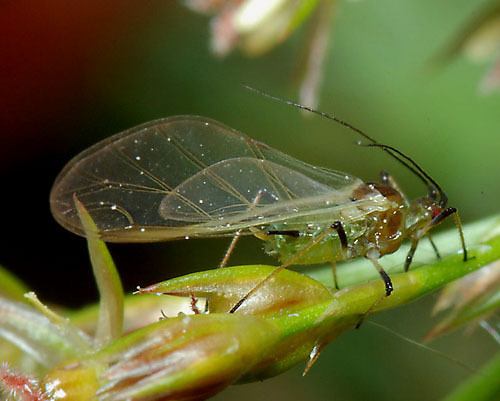 Aphid populations were 18% higher at reduced densities of ground-dwelling predators, 70% higher when flying predators and parasitoids were removed, and 172% higher on the removal of both enemy groups. Parasitoid wasps probably had the strongest effect, as flying predators occurred only in negligible densities. Unusually Sitobion avenae is polymorphic with regard to overwintering strategies. There are four types of clones: pure holocyclic clones producing only males and egg laying females in autumn; intermediate clones producing both sexual morphs and parthenogenetic females; androcyclic clones producing only males and parthenogenetic females; and anholocyclic clones which produce only parthenogenetic females regardless of the environmental conditions (Hand & Wratten, 1985; Wegorek & Dedryver, 1987; Newton & Dixon, 1988). Such polymorphism in reproductive strategies for overwintering is mainly observed in temperate regions, and provides a way for the species to maximize its fitness facing winter climate uncertainty. 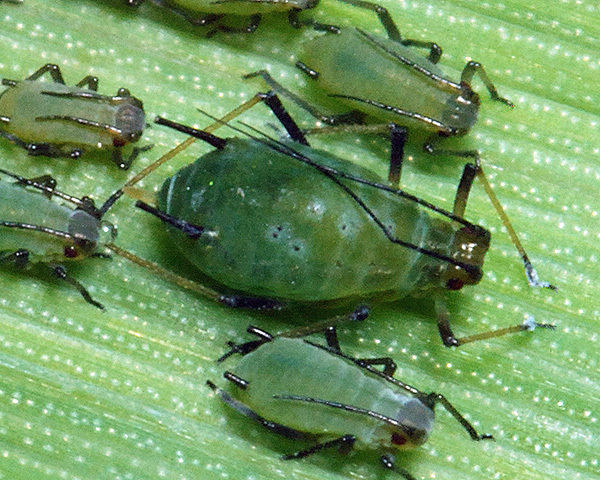 Cereal aphids reduce yield by sucking sap from the plants, by excreting honeydew which becomes covered with sooty moulds and by transmitting barley yellow dwarf virus. Currently a large proportion of UK wheat is treated with broad spectrum insecticides to control cereal aphids. 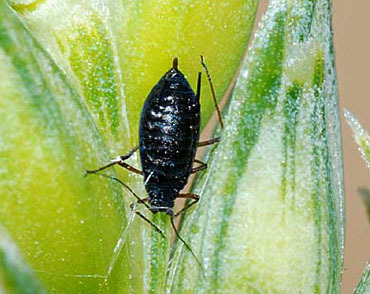 Although economic thresholds for direct effects of cereal aphids have been established (generally taken to be five aphids per ear at flowering - Giller et al., 1995), there is no threshold for virus transmission, and so farmers tend to spray routinely irrespective of how many aphids are present. This is moderately effective in the short term, but is expensive and in the long term is likely to result in the development of pesticide resistance - quite apart from the environmental harm caused by broad spectrum insecticides. Another approach (complementary if specific aphicides are used) is to use a range of management techniques to promote natural biological control. These include allowing umbellifer flowers and stinging nettles to flourish in field margins and set-aside areas to provide nectar for adult syrphidae and alternative prey for coccinellids. Whilst very promising, the adequacy of this approach has not been rigourously tested in randomized trials. This is one reason why scientists at a research institute in Britain (Rothamsted Research) have recently embarked on a controversial trial of genetically modified wheat. The approach here has been to use biotechnological tools to genetically engineer a wheat plant that produces an odour, or alarm pheromone, which aphids produce to alert one another to danger. This odour, (E)-beta-farnesene, is also produced by some plants as a natural defence mechanism, and not only repels aphids, but also attracts the natural predators of aphids. The decision to use genetic modification as a tool was made after synthetic dispensers failed to provide effective delivery (Rothamsted Research, 2012). The trial has provoked intense reaction from anti-GM groups which are concerned about the possibility of cross-fertilization and the effects on neighbouring farms (GM Freeze, 2012). They have described the GM wheat trial as a step backwards for farming, arguing that there is no market for it and anyway there are viable, non-GM, non-chemical, acceptable agronomic approaches to dealing with cereal aphids. Some reports suggest that £120,000 of the £800,000 research grant has already been spent on security to guard against a protest planned in May 2012. The main argument of anti-GM groups that doing a trial outdoors may 'contaminate' other crops of wheat grown in the area. It is possible (albeit unlikely) that pollen from these plants will reach others, but it is perhaps more important to assess whether the term 'contaminate' is the right term to use. The compound (E)-beta-farnesene occurs naturally in hops and many other plants, and is certainly present in beer. There is no fundamental reason why genetic modification is likely to be any more dangerous than the (anything but natural) methods of plant breeding that have been used to develop high yielding varieties of crops over the past few hundred years. The results of his trial were published in 2015 (Bruce et al., 2015) under the title "the first crop plant genetically engineered to release an insect pheromone for defence". The trials showed no reduction in aphid numbers nor increase in parasitism in plots planted with the transformed wheat compared to untransformed wheat. Sitobion avenae has been recorded on 2 species of the Holcus genus: Holcus lanatus (Yorkshire fog) and Holcus mollis (creeping soft grass). Blackman & Eastop list 25 species of aphid as feeding on Holcus grass species worldwide, and provide formal identification keys. Of those aphid species, Baker (2015) lists 23 as occurring in Britain: Anoecia corni, Atheroides serrulatus, Cryptaphis poae, Diuraphis frequens, Diuraphis holci, Forda formicaria, Geoica lucifuga, Geoica setulosa, Geoica utricularia, Hyalopteroides humilis, Laingia psammae, Melanaphis pyraria, Metopolophium dirhodum, Metopolophium festucae, Rhopalosiphum nymphaeae, Rhopalosiphum oxyacanthae, Rhopalosiphum padi, Schizaphis holci, Sipha glyceriae, Sipha maydis, Sitobion avenae, Sitobion fragariae, and Tetraneura ulmi. Sitobion avenae has been recorded on 13 species of the Poa genus. Sitobion avenae has been recorded on 10 species of the Hordeum genus. Sitobion avenae has been recorded on 4 species of the Triticum genus (Triticum aestivum, Triticum dicoccum, Triticum durum, Triticum turanicum). Sitobion avenae has been recorded on 1 species of the Zea genus (Zea mays). Sitobion avenae has been recorded on 1 species of Oryza: Oryza sativa (Asian rice). 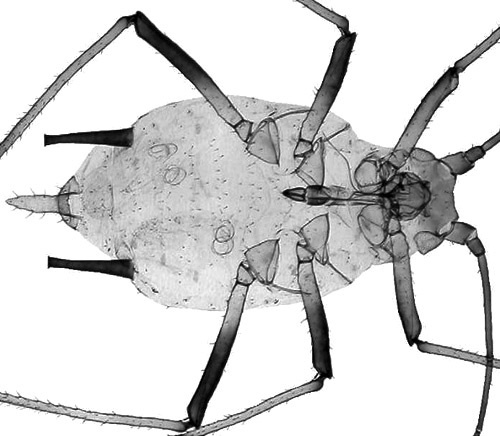 Of those aphid species, Baker (2015) lists 15 as occurring in Britain: Anoecia corni, Aphis gossypii, Geoica setulosa, Geoica utricularia, Metopolophium dirhodum, Paracletus cimiciformis, Rhopalosiphum maidis, Rhopalosiphum nymphaeae, Rhopalosiphum padi, Rhopalosiphum rufiabdominale, Rhopalosiphum rufulum, Sipha glyceriae, Sipha maydis, Sitobion avenae, and Tetraneura ulmi. Wegorek P. & Dedryver, C.A. (1987). Effect of temperature and photoperiod on the production of sexual morphs by different clones of cereal aphid Sitobion avenae. Entomologia Experimentalis et Applicata, 45, 89-97. Wratten SD & Powell W. (1991). 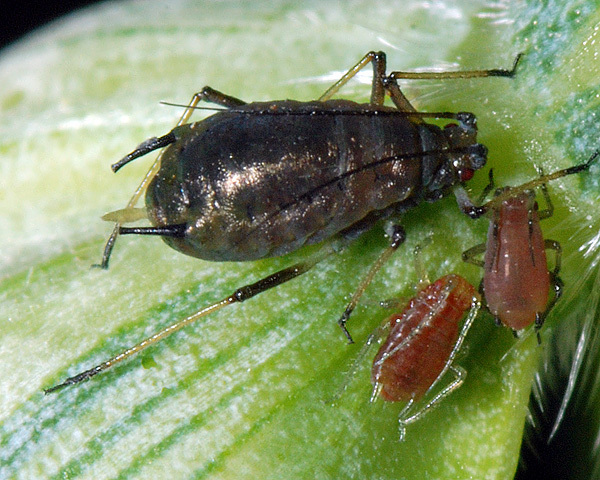 Cereal aphids and their natural enemies. In: Firbank L.C. et al. (eds): The Ecology of Temperate Cereal Fields. 32nd Symposium of the British Ecological Society. Blackwell, Oxford.